Both the small and large bowel may suffer obstruction of their lumen that prevents the movement of the food bolus along the bowel. There are various causes of bowel obstruction. As with other hollow organs of the body, these can be considered in four general categories. This scheme is useful for ensuring that all possible conditions are considered and is therefore helpful in generating comprehensive, structured lists. However, it does not automatically produce a list that emphasises the common or clinically important disorders and debates can also arise as to whether a particular lesion is better classified as being a luminal or intramural process. A more specific list of those diseases likely to be relevant to cut up is as follows. Previous intra-abdominal surgery may cause loops of bowel to stick together. This can impair peristalsis and may progress to obstruction. Similarly, the healing response to the surgery can give bands of fibrous tissue which compress and obstruct the bowel. The small bowel is more likely to be affected by these processes than the large. Hernias are defects in the abdominal wall. Loops of bowel can protrude through them. If the neck of the hernia becomes constricted it can obstruct the bowel. This process can also block the blood flow (strangulation). It is usually only loops of small bowel that enter hernias. 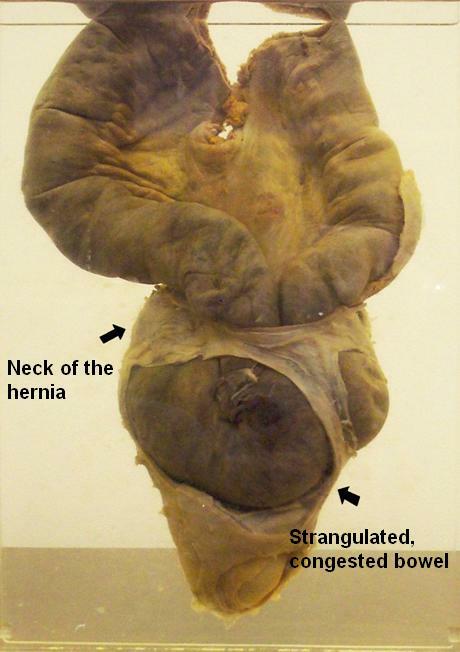 The photograph shows a pot that contains a strangulated hernia. Loops of small bowel have entered the hernial sac (bottom part of the specimen). If sufficient numbers of loops enter a hernia, they may block their movement back out of the hernia and become trapped (an incarcerated hernia). If further constriction occurs at the neck of the hernia, venous blood flow out of the bowel loops is obstructed. 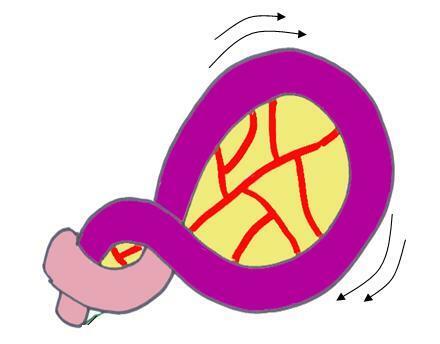 The loops of bowel become engorged with blood, increasing the degree of constriction at the neck. The lumen also becomes occluded and the passage of the food bolus is blocked. Volvulus is a process in which a loop of bowel becomes twisted round on itself causing constriction of the neck of the loop of bowel with obstruction of both the lumen and venous drainage. Volvulus tends to affect a sigmoid colon which has a long mesentery and is therefore free to move and twist. Intussusception occurs when one part of the bowel attempts to engulf the adjacent proximal segment. It can occur spontaneously in young children but in older age groups it typically only happens if there is an underlying problem, usually a mass lesion that protrudes into the lumen. The bowel distal to the mass attempts to move the mass along by peristalsis as if the mass was a bolus of partially digested food. This pulls the bowel attached to the mass into the neighbouring segment of bowel and obstruction follows shortly after. The blood vessels which supply the intussuscepted length of the bowel are compressed and ischaemia can result. 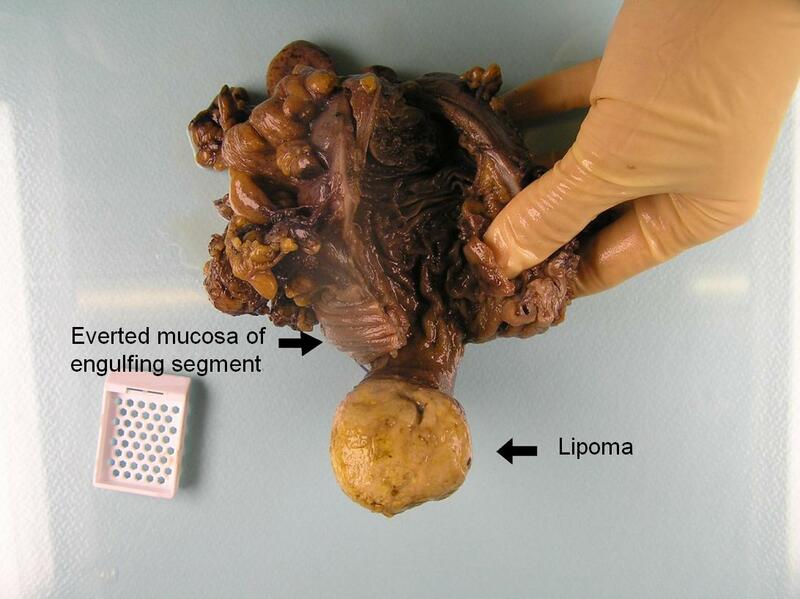 This segment of bowel has undergone intussusception due to a submucosal lipoma at the ileocaecal junction. The lipoma has been swallowed by the distal part of the bowel and this has drawn the root of the lipoma into the distal segment. The ileocaecal valve is a common site for bowel lipomas. The food bolus cannot move past the obstructed segment of the bowel. The blockage of flow in the intestines leads to distention of the more proximal parts of the bowel. Ultimately, the obstruction will cause vomiting as food cannot move out of the stomach and proximal small intestine. The distension of the bowel, coupled with the forceful contractions the bowel makes in an attempt to overcome the obstruction can cause severe, often colicky or cramping pain. If the obstruction is unrelieved, the persistent vomiting results in dehydration and disturbances of electrolytes. The loss of gastric acid can also cause a metabolic alkalosis. The continuation of normal intestinal secretion, which now cannot be absorbed due to the obstruction, also contributes to loss of water and electrolytes. Some causes of obstruction also produce ischaemia of the obstructed segment of the bowel and thus the process can be complicated by the features of ischaemia. Ultimately, obstruction may result in perforation of the bowel. Many cases of obstruction of the bowel require treatment by surgery. The surgery usually involves removing the obstructed segment of the bowel. For diseases such as strangulated hernias, volvulus and intussusception, the cause of the obstruction will be determined at the time of the operation and will often not be apparent from the macroscopic examination in the first two instances because the loops of bowel have been freed or untwisted. With the exception of very young children, intussusception does not occur spontaneously and instead is caused by an underlying mass lesion. The histopathological evaluation of the specimen aims to determine the nature of that mass lesion and its other relevant properties. In other diseases, histopathological examination is necessary to determine the cause of the obstruction and any relevant parameters associated with that cause (albeit that in many instances there is a strong clinical and/or surgical suspicion as to the likely aetiology). For example, if the obstruction is produced by a colorectal carcinoma, the examination of the bowel would need to characterise the tumour as for any elective excision of a neoplasm. In these other diseases, the macroscopic assessment of the specimen will often be crucial in determining the cause of the obstruction as the abnormalities should be apparent at this level, such as the presence or absence of a tumour, or diverticular mass. The blocks that are taken in obstruction are determined by the macroscopic findings of the specimen. There are no blocks which are unique or peculiar to obstruction itself. Conditions such as tumours and diverticular disease may impede the movement of the food bolus / stool, but do not completely obstruct the bowel. In such circumstances the smooth muscle of the bowel proximal to the partially occluded segment will undergo hypertrophy. This may be seen macroscopically as a thickened bowel wall. Motility disorders of bowel will tend to present as chronic constipation rather than acute obstruction. Their diagnosis can be difficult and may rely upon an exclusion of other causes. Hirschprung's disease is a paediastric condition characterised by an absence of ganglion cells and is therefore amenable to morphological histopathological diagnosis but other diseases may be more difficult to identify. Sampling of colectomy specimens from these patients is guided by general principles and sequential longitudinal sections.